Please click any Title or Read More link below to view full article details. HAFF sponsors the Irish Festival! The Heather A. Freeman Foundation is excited to be a "Leprechaun" Sponsor for the Annual North Country Goes Green Irish Festival! Held the weekend of March 17-19, 2017 at the Dulles State Office Building.Picture (L-R) Dave Missert Jr., Irish Fest Committee; Lynn Pietroski, HAFF; Karla Stefanini, HAFF; Michelle Titus, HAFF; Patti Shaughnessy, Irish Fest Committee. HAFF is a proud supporter of the Victims Assistance Center of Jefferson County. HAFF Kicks 4 Kids program at its Finest! We are very proud of our Kicks for Kids Program! Getting this update from Avon Shoes and the dedicated staff at Benchmark Family Services is much appreciated! The smiles are adorable! Save the date! Spirit in the Sky Dinner, March 13, 2017! Spirit in the Sky Annual DinnerMonday, March 13, 20176:00p.m. to 8:00p.m.Sboro's Restaurant & Chop House836 Coffeen Street, Watertown, NY 13601$50. donation per personTickets are available from any of our Board Members or click on the "Contact us" link on our home page. Space is limited ...so don't miss out! HAFF Angel Tree to be auctioned! Our (Heather inspired!) Angel Tree was selected to auctioned off for charity at the "2016 A North Country Festival of Trees" Live Gala Auction! We enjoyed participating in this festive local event again this year! Date Set for 7th Annual RUN to the SUN! HAFF was excited to sponsor & decorate our first tree for this years Festival of Trees. It was a great time for a super cause!Theme: Elfin' Around the Christmas Tree. HAFF donates to South Jefferson Winter Closet Drive! HAFF was so proud to shop for and donate $1000 in winter clothing for the SJ Winter Closet Drive! Snowpants. Winter jackets. Boots. Hats. Gloves. Underwear & Socks. All for the kiddos of our community! — at South Jefferson Central School. Heather A. Freeman Foundation donates $3000 to The NYS ZOO at Thompson Park! HAFF renewed its annual commitment to the NYS State ZOO at Thompson Park. Please stop in and enjoy our Heather A. Freeman Foundation Butterfly House! HAFF RUN to the SUN interview on Channel 7! Tuesday, July 29th set for 7th Annual Golf tournament! 2014 Run to the Sun on wwny tv 7! HAFF releases 2014 Spring Newsletter! Learn more about HAFF and see what we have been up to in 2013!HAFF 2014 Spring Newsletter! Heather A. Freeman Foundation Sponsors a free Movie Under the Stars in Thompson Park. HAFF donates bicycles and helmets to Ohio Street School. HAFF donated 2 bicycles and helmets for a new initiative at Ohio Street School in Watertown to reward students for excellent behavior and good deeds. Heather A. Miller is the recipiant of the HAFF 2013 Carthage High School Scholarship! Heather A. Miller, 2013 HAFF $500 Scholarship winner at Carthage High School. Rachel Sousa receives the 2013 Stage Notes Scholarship from HAFF! Rachel Sousa was awarded the 2013 HAFF Stage Notes Scholarship at the 3rd annual HAFF Run to the Sun! North Country Idol contestant Amanda Bellnier raises $819 for HAFF! 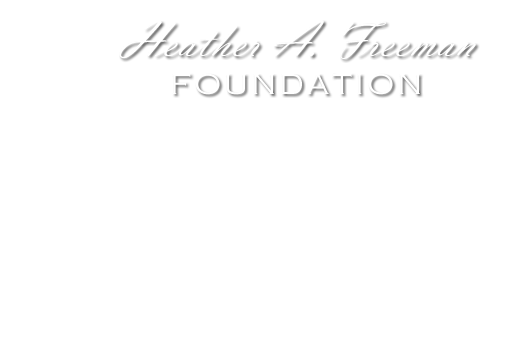 Heather A. Freeman Foundation approves $10,000 donation to the Watertown Urban Mission’s Capital Campaign. Heather A. Freeman Foundation donates $1000 to the Jefferson County SPCA. The Heather A. Freeman Foundation will host its second Kicks for Kids program beginning this week, which gives 200 Jefferson County children a $50 voucher each to buy a pair of new shoes for school at Herb Philipson’s, 1283 Arsenal St.Vouchers will be awarded throughout the next few weeks to children in need who have been identified by community agencies and school districts.Terra L. House, foundation board member, said vouchers will be good through Nov. 30.The event is held each year in memory of Mrs. Freeman, Watertown, who died at the age of 32 in a 2007 motorcycle accident. The Heather A. Freeman Butterfly House at the New York State Zoo at Thompson Park will open for the season Saturday.The exhibit is home to numerous native species of butterflies and allows guests to encounter the insects in an environment that is safe for the butterflies. The Butterfly House, sponsored by the Heather A. Freeman Foundation, was built in 1997 and dedicated to Mrs. Freeman in 2008.The zoo is open from 10 a.m. to 5 p.m. daily.